As my garden developed into several different levels in a variety of garden styles, it became obvious that I needed some vertical elements not only to add height to each of the gardens but also to offer this crazy, intense ‘patch work quilt’ of a garden some cohesiveness. I began to contemplate the type of design that would work well in the garden. Because the style of my home is vanilla and architecturally cold and flat, I was determined to create a garden that had an ‘aged’ romantic/rustic look (if that’s even possible). I had recently renovated the inside of my home and used wood beams throughout: it seemed natural to duplicate that element in the garden. By chance, one day while taking a brisk walk with a friend in Central Park, I came upon some wooden cedar arbors that I fell in love with. After a slew of phone calls, I was able to track down the creator of these structures. It was a fellow by the name of David Robinson who operates his business, Cutting Edge, in Trenton New Jersey. One thing led to another and after a few sketches done by my architect, David began to build some arbors for my cutting garden. There are actually 3 arbors in this garden. The first one allows for two magnificent Rosa ‘Constance Spry’ climbers to spill all over the place with its full pale pink blossoms in early June. Unfortunately, when I planted these rose bushes, I wasn’t aware that there was a c ontinually blooming one (or it wasn’t yet in existence). I’m chalking this mistake up to experience. At the end of the garden, David built another arbor where a soft yellow, sweetly scented climber (I believe it is Rosa ‘Graham Thomas’) is continually in bloom until mid-fall. I love the rhythm and spacing of these 2 arbors. In the pictures , you can see how they look bare in early spring vs. later in the season when the garden is in full bloom. I can’t imagine how the cutting garden would ‘be’ without them; one dimensional and lackluster I think. Perpendicular to these arbors is the entryway to my garden: it is sitting right on top of the edge of the driveway. Previously, I had a carpenter build an arbor made of pressure treated wood for the entryway (which I painted a lime green color). 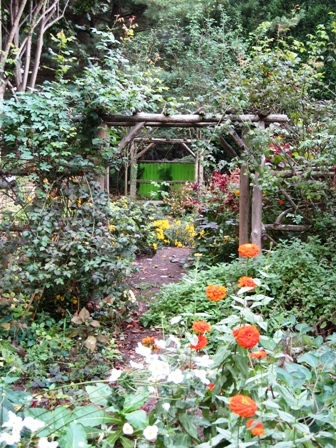 That first arbor did the trick in that it let visitors know that they were entering the garden. And like Nan mentioned in her posts, it allowed me to experiment with some wonderful climbers. But once the other 2 arbors had been built, it became apparent that my chartreuse arbor was the ‘odd man’ out. Before the year was out, my lime green arbor was dismantled and David built a third arbor that echoed the style of the first two. 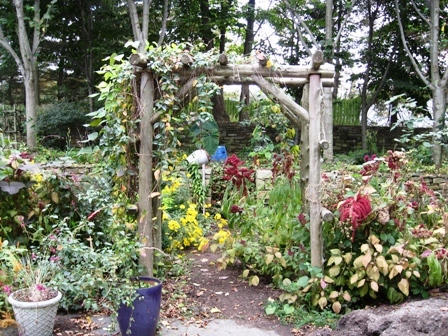 On this arbor, I have one perennial vine, Bignonia grandiflora which performs beautifully each year. Although I’ve experimented with a slew of annual vines over the years, I continue to return to the purple hyacinth bean (Dolichos lablab). Somehow, the orange and purple colors with their flowers entangled from early summer throughout fall just can’t be beat. It is only when I stand gazing at the cutting garden from time to time that I fully appreciate how seamlessly they pull all of the elements of this little area together to offer a sense of completion.